Apple is now officially selling its all-new iPad Air through retail stores worldwide, resellers, and its own web store, with varying availability by territory. After shuttering its online store to update the listings for iPad Air, Apple today started taking orders for the upgraded tablet computer. It appears that, just like the iPad mini with Retina Display, the iPad Air is also coming in short supplies, despite optimistic projections from various analysts. 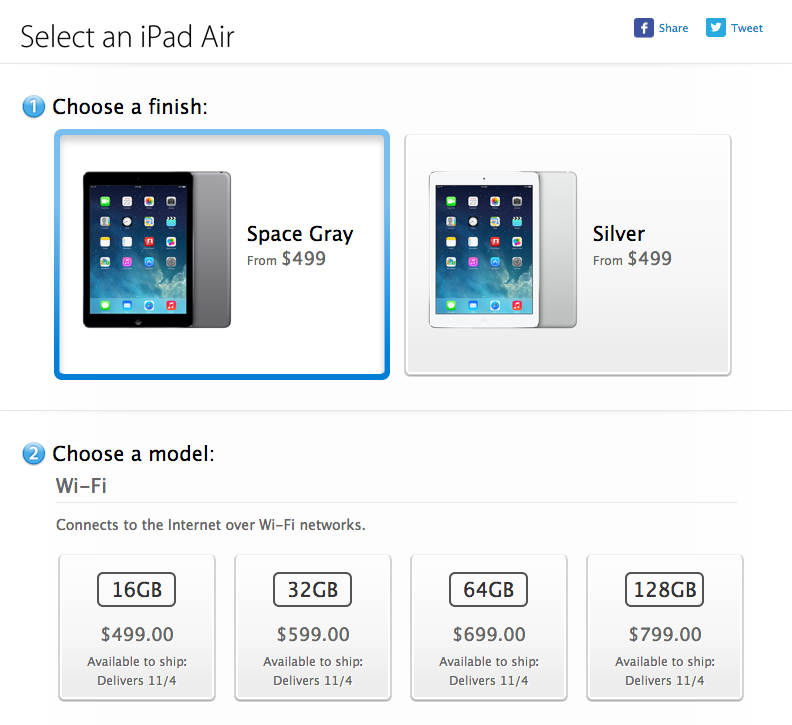 iPad Air comes in 16GB, 32GB, 64GB, 128GB configurations. The tablet starts at $499/€479 for the 16GB version with Wi-Fi-only connectivity. Cellular models are also available, at higher price points. “It is so thin, light and powerful, once you hold one in your hand you will understand what a tremendous advancement this is,” said Schiller. The product is set to launch today (at 8:00 AM local time) across dozens of countries around the world, including Australia, Austria, Belgium, Bulgaria, Canada, China (Wi-Fi models only), Croatia, Cyprus, Czech Republic, Denmark, Estonia, Finland, France, Germany, Greece, Hong Kong, and many other territories. Customers can also buy new, custom-designed polyurethane Smart Covers for the tablet in a new range of colors, including blue, green, pink, yellow, black, and a Product (RED) version which supports the fight against AIDS in Africa. Aniline-dyed leather cases are also available in six colors, including yellow, beige, blue, brown, black, and (RED).